In the famous Greek myth everything touched by King Midas turned to gold. What was a curse for his majesty could be just the opposite in Age of the Gods: Mighty Midas, another video slot in Playtech’s popular Age of the Gods series. It’s a highly volatile 5 reel, 40 payline game that comes with plenty of wild extras and 6 bonus features. Play on all devices from 40p to £2,000 per spin. As you might expect from a video slot called Age of the Gods: Mighty Midas, there’s plenty of gold on show here. The images on the reels conjure up a bacchanalian feast and include bunches of grapes, goblets of wine, apples, roses and a roast chicken. More rewarding are the 5 character symbols. The smiling king is the top payer, delivering 12.5 times your stake if you land 5 on a payline. Keep a special eye for the giant golden finger which appears on reels 3, 4 or 5 only. This is the Magic Touch symbol. Whenever this lands, it turns the symbol directly to its left into a wild. A symbol drop then takes place and a payout is made. If you land a Midas Touch next to a golden wild, the symbol gets a multiplier boost. A standard Golden Wild goes from 1x to 2x while a 2x golden wild turns into a 3x wild – this is called the Midas Multipliers feature. Emerald Bonus feature – the scatters from the triggering spin transform into a cash award and a multiplier which are combined to give you your overall prize. I’ve won 300 times your bet here before. Ruby Spins feature – with 7 free spins, multiplier wilds are central to the action in this feature. Keep track of the multipliers via the tower next to the reels. The Midas Touch can combine multipliers which can send them rocketing by up to 30x. Amber Spins feature – on each of your 5 free spins, a symbol is chosen at random to become a Golden wild which can go up to 3x. Sapphire Spins feature – 5 free spins are awarded in this round. On the first of them, 55 wilds are added to reel 2. One the second, 40 wilds are added to reel 3 with 60 wilds added to reel 4 on the third. Once live, these extra wilds are in play for the rest of the feature. Amethyst Spins feature – with 3 free spins on offer, the Midas Touch symbols are double stacked during this feature. Expect to see plenty of wilds and multipliers here. You’ll also have a chance to land a progressive prize here as Age of the Gods: Mighty Midas is part of the Age of the Gods Jackpot Network. This can trigger at random on any spin. We enjoyed Age of the Gods: Mighty Midas. The design is as high spec as usual and there’s a terrific range of extras on offer. Be warned though, this is a very volatile video slot with top rewards of 8,650 times your bet on each Ruby Spin (due to the potential 30x multiplier). This is one of the best additions to the Age of the Gods series. 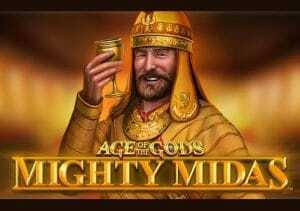 If you like the myth and legend theme, then Age of the Gods: Mighty Midas is well worth a spin. I also recommend you try Age of the Gods: Goddess of Wisdom and Age of the Gods: Medusa and Monsters.